Preheat oven to 350 degrees. Line baking sheets with parchment paper and set aside. In a large bowl, cream butter, 1/4 cup confectioners sugar and regular sugar. Add in water and vanilla until combined. Slowly add in the flour and mix well. Fold in the pecans until evenly distributed through out the dough. 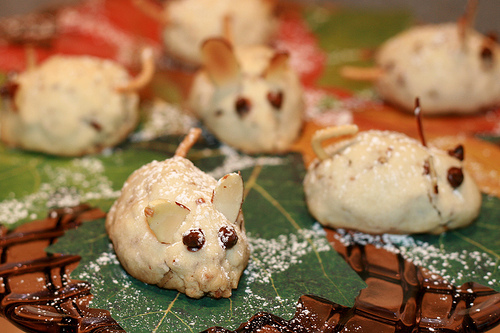 Shape about 2 tablespoons of the dough into an oval to form a mouse body. Gently pinch tone end to create a little face. Place 2 mini chocolate chips onto the face for the eyes, 2 slivered almonds on top of the head for the ears and 1 broken piece of raman noodle on the other end for the tail. Repeat with remaining dough and place onto cookie sheet. Bake for about 25 minutes or until golden. Remove from oven and dust with remaining 1/4 cup of confectioners sugar. Enjoy!